In 2013, Maya Mori started Frankie & Coco PDX with a stack of vintage fabric, her grandmother’s sewing machine and some simple sketches. Her products are handcrafted from start to finish. After years of working from home, she expanded into a lovely, light filled space in The Makery, a NE Portland studio collective, in 2017. 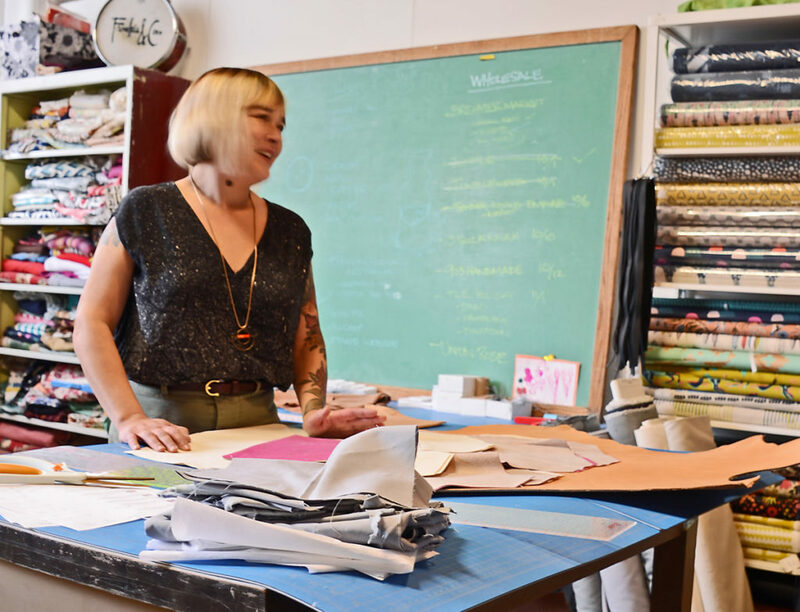 Maya embodies the thriving Portland local maker scene. We recently caught up with her to learn more about her business and design inspiration. 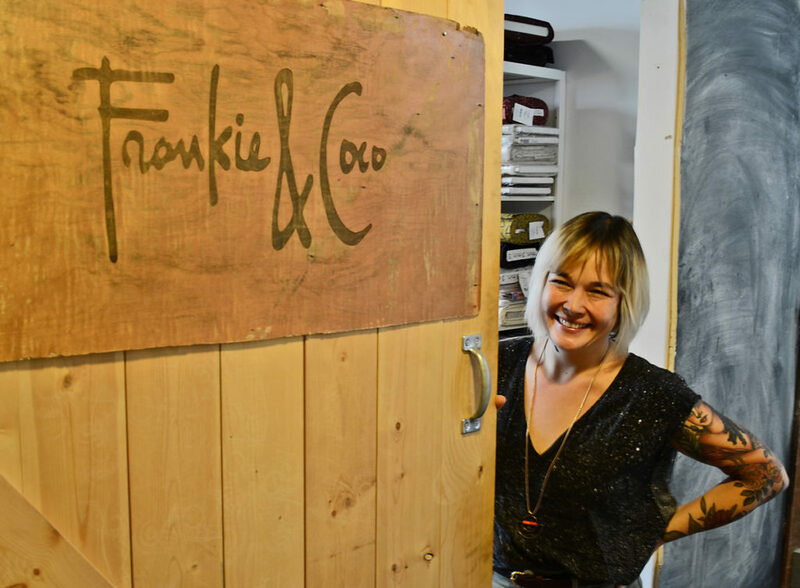 How did Frankie & Coco PDX get started? What inspires you and your products? I originally meant it to be a creative side project, but quickly had to adjust to it being a full time business. The business is named for my two youngest daughters, who were then 1 and 4. I believe in one-of-a-kind detailing and make modern, functional and beautiful products with an emphasis on color, pattern and texture. I am half Japanese and have a deep appreciation for the culture. I use many Japanese textiles, loving the feel and graphic patterning. I pride myself on meticulous craftsmanship, unique details and quality materials. My style is joyful and exuberant, yet relaxed. What is the most challenging, rewarding and/or surprising aspects of owning your own business? Doing every aspect of the business myself has its challenges and I hope to start hiring in the future. I would like to be able to work more on new products and evolving the business. 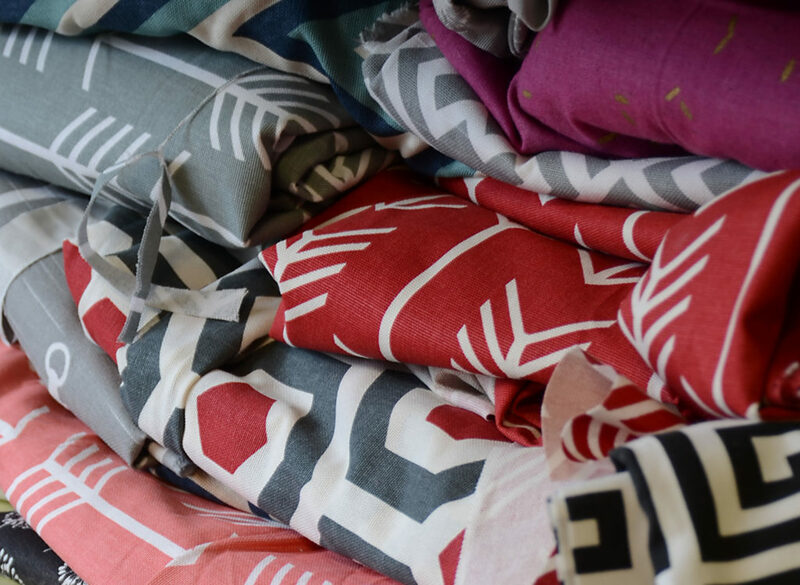 Eventually, I will design and print my own fabrics – making every aspect of the products my own. I get to the studio early and maintain a pretty strict schedule to balance my business and family responsibilities. I am truly grateful for my wonderful family and attribute all my success to them. My husband, who is graphic designer / musician / artist and my four children inspire me daily to be focused, creative and courageous. My creative process is pretty organic. I generally start with a shape in my mind, create a rough sketch and then make the pattern. Once I have a working pattern, I play with color, texture and interesting graphic combinations until it feels right. Currently all my products are made to order and I encourage customization. When you purchase a bag, you can choose the style, size, lining and zipper colors. This might not be a practical model, but I want my goods to feel unique and for the customer to be a part of the design process. This way they end up with something they are connected to and truly love. What has been challenging in regards to growing your business? The majority of my sales are online, either in the Etsy shop or my website. I shifted into wholesale a few years ago and have established some really great relationships with shops across the country. I participate in a handful of craft / makers shows and really appreciate those moments to connect in person with my customers. When I visualize the future of Frankie & Coco PDX, I want to make all the products in house, in Portland. I would like to keep it small and personal, while still allowing for growth. This would involve finding the right people to take over key aspects of the business, help with production and allow me the freedom for creative process / product development / fabric design / etc. Portland is a wonderful place to live and be a creative person. I am inspired by so many small businesses / makers, but here’s some of my favorites. Lisa Jones & Samantha Cole // Pigeon Toe Ceramics (which is also where my studio is located), motivate me daily with their gorgeous ceramics, innovative design, teamwork and determination. Lori Caldwell // Minnie + George makes gorgeous leather goods, stitched by hand. Not only is she an accomplished designer, but one of the most kind, and encouraging humans ever. Natalie Miller // Natalie Joy Jewelry makes modern, bold, mixed metals jewelry, has a killer work ethic and is a lovely person. I feel so grateful for all the encouragement, positive feedback and support I have received since starting my business. The makers community is strong and holds each other up. I am a member of Portland Made and appreciate all the resources and promotion they have given me. I source all my leather from Oregon Leather Company, which is located in Old Town and is so warm, unique and helpful. Again, huge thanks to Lori of Minnie + George for helping me figure out leather! It’s amazing to have other makers willing to give their time & knowledge. My business cards and tags are beautiful letterpress, made by Studio Olivine, a local and amazing business. My very first wholesale account was with Tender Loving Empire, a Portland staple. Back then they had the one store downtown. Fast forward to present day and they have 4 locations, while still maintaining an intimate, warm, unique vibe. If you want to be featured with our Portland A&O Community, submit your story today!